WHEN IS THE GRAN FONDO STRADE BIANCHE? AM I ELEGIBLE IF I AM NOT A MEMBER OF ANY TEAM? WHAT IF I DO NOT HAVE THE SPORT-MEDICAL CERTIFICATE? We cannot provide you the Daily Card and you are not eligible for the Gran Fondo. WHAT IS THE CARD FOR? WHO HAS TO BUY THE DAILY CARD? The Daily Card is a document for the athletes that are not member of any team. The Daily FCI Card allows you to be covered by the insurance that all team members have. The price (set by Federazione Ciclistica Italiana, FCI) is €15. WHICH ARE THE REGISTRATION METHODS? The registration must be done only and exclusively online with credit card on the website www.endu.net. It will be possible to pay the Daily Card online in order to avoid the queue at the race number collection. CAN I SIGN UP IN THE MORNING OF THE RACE? No, registrations close on 1st March 2019 at 00.00. The registration must be done only and exclusively online with credit card on the website www.endu.net. It will be possible to pay the Daily Card online in order to avoid the queue at the race number collection. WHEN DOES THE REGISTATION PERIOD CLOSE? I HAVE SOME ISSUES WITH THE ONLINE REGISTRATION PROCESS, WHAT CAN I DO? check if you have received an email from Sdam. If you have received the email, you are successfully enrolled for the race. HOW MUCHI S THE PARTICIPATION FEE? The participation fee is €70. WHAT TIME CAN I BE AT MY STARTING GRID? HOW CAN I KNOW MY RACE NUMBER? Race numbers are provided after the registration deadline, from the 1st March. They will be communicated via email with all the useful information in the days following the registration deadline. WHEN AND WHERE IS THE RACE NUMBER COLLECTION? Saturday 9th March 2019 at the Fortezza di Santa Barbara (Fortezza Medicea), Siena from 09.30 a.m to 7.00 p.m.
WILL THERE BE STARTING GRIDS? Yes, the first 2000 numbers will start in grids, which will be communicated to the participants, located on the wall of the Fortezza Medicea. The next numbers will be divided in grids located in the parking outside the Fortezza. The organization will disqualify immediately who will be caught picking a different grid and who will be caught in a starting grid with a different race number. WHAT HAPPENS IF I AM NOT ABLE TO PARTICIPATE? If you are enrolled and you cannot participate, the entry fee won’t be refunded. In this case you must communicate it at rcsactiveteam@gmail.com by the 5th March 2019 at midnight, in order to make your entry fee available for the 2020 race. The registation valid for the next year is nominal and it can’t be given to others and it is valid only for the next year and it will guarantee the position at the start of the 2019. Substitutions between athletes are admitted only by the 1st March 2019. For this operation it will be requested an extra fee of €10,00. SHOULD I BRING SPECIFIC DOCUMENTS FOR THE RACE NUMBER COLLECTION? You have to bring your membership card or the sport-medical certificate if you are enrolled as “individual”. CAN I DESIGNATE SOMEONE ELSE FOR THE RACE NUMBER COLLECTION? Yes you can. It will be necessary to provide at the race number collection a signed mandate, a copy of your membership card and a copy of your ID. HOW DOES THE TIMEKEEPING WORK? 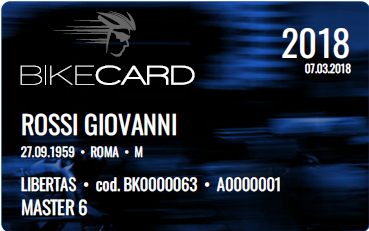 Gran Fondo Strade Bianche uses the official Timer MySDAM with technology based on a “chip”. Each participant will wear a personal chip or a daily chip (it can be rent) in order to appear in the standing. The wrong or missed use of the chip will not make you appear in the standing and your time won’t be measured. IS THERE A TIME LIMIT TO COMPLETE THE RACE? Yes. You can take 7 hours max to end the race. The race closes by the 3.30 p.m of the 10th March 2019. WHERE DO I FIND THE STANDINGS? The final standing will be available on the newspaper and on the website www.gfstradebianche.it. The Team standings will be available considering the number of the athletes regularly departed. WHAT HAPPENS IF THE “END OF THE RACE” CAR OVERTAKES ME? The athletes overtaken by the “end of the race” car will continue the race as normal cyclists and they must observe the traffic laws keeping the race number on their back. WILL THERE BE A BROOM WAGON SERVICE? Yes, it will be at the tail of the group. Please keep in mind that the bicycles of the forfeiting participants will be brought inside the Fortezza Medicea. It will be possible to collect your bicycle by showing your race number and your ID. It is not guaranteed that the broom wagon will come back at the technical area at the same time of the bicycles collected. WHAT IS HAPPENING IF IT TAKES MORE TIME THAN THE FIXED LIMIT TO FINISH THE RACE? The organization doesn’t guarantee any services to the participants which will not figure in the standing. ARE THERE ANY FEEDING POINTS? Yes, there are three refreshment points. HOW MANY FEEDING POINTS ARE THERE AND WHERE? WILL THERE BE THE OPPORTUNITY TO EAT AFTER THE ARRIVAL? Yes, inside the Race pack together with your race number, you will find a voucher for the Pasta Party at technical area(?). Relatives and friends can benefit from the same service by paying a little duty at the technical area. ARE THERE SHOWERS AVAILABLE FOR THE PARTICIPANTS? Yes, there will be showers for all participants at Stadio Artemio Franchi (next to Fortezza Medicea). IS THERE A BREAKDOWN ASSISTANCE ALONG THE ROUTE? Yes, there is. You will find cars and scooters following the group and the checkpoints located in the same location of the refreshment points. Any private assistance is strongly forbidden. However, it is allowed to make provisions at the feeding points. Yes, there is. You will find ambulances, medical car and scooters and qualified paramedics. IS THERE ANY RADIO ASSISTANCE? Yes, there is along the route and at the finish line. WHICH ARE THE RIGHTS AND THE DUTIES? Gran Fondo Strade Bianche is an agonistic/competitive/ sporting event, so the traffic laws are in force. The athletes overtaken by the “end race” car have to continue the race as common cyclists keeping the race number on their back. It is absolutely forbidden to throw waste along the route, in order to protect the environment. It is mandatory to throw the waste in the specific baskets at the feeding point or at the finish line. The organization will disqualify those who won’t follow the rules.